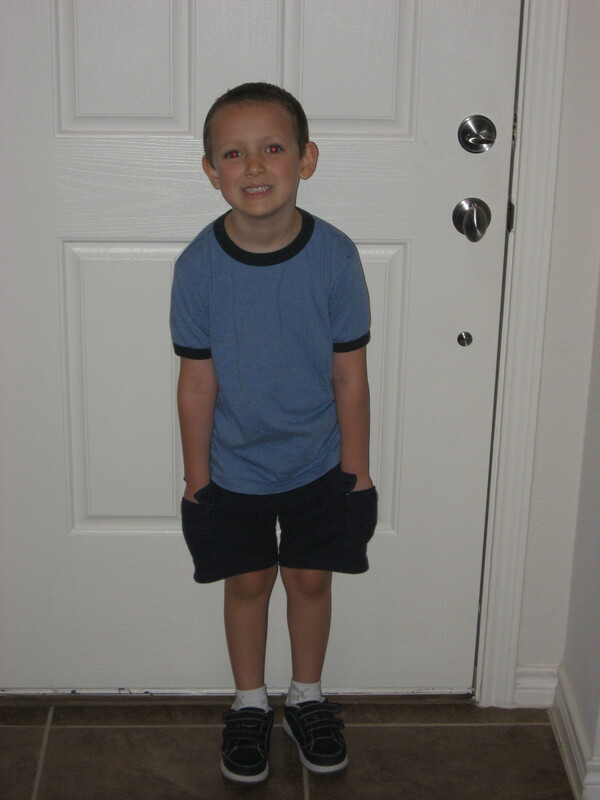 Unbelievably, Ethan is now in Kindergarten! We are extra thrilled with his teacher and very pleased with the interest the administration and staff has taken in him! While Ethan does have an IEP (Individual Education Plan) which sets goals for the staff to work on with Ethan, he is 100% mainstreamed into a “typical” Kindergarten setting. For a short time each day, he will check in with the Content Mastery teacher. 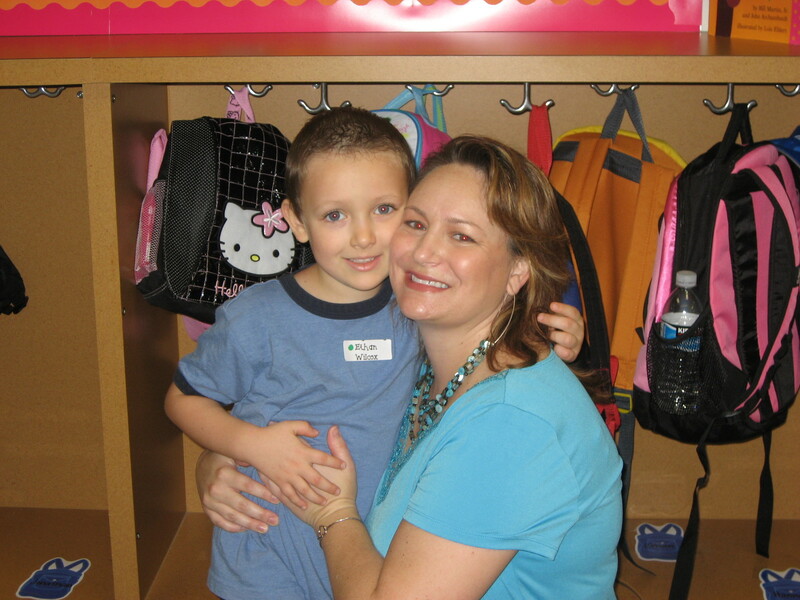 She will also be working alongside his teacher to help him develop more age-appropriate social skills. Plus, I just got an amazing e-message from the school’s librarian today telling me that Ethan had a fantastic day in the library with his class yesterday. (I also got the news in person while I was volunteering on the campus this morning and ran into the wonderful Mrs. Lincoln.) But, it was so nice to be able to forward the message along to Greg so that he, too, can share in the joy of knowing that Ethan was waiting his turn to answer questions, sitting quietly when expected and making appropriate eye contact with the teachers and his classmates! Yay, Ethan! 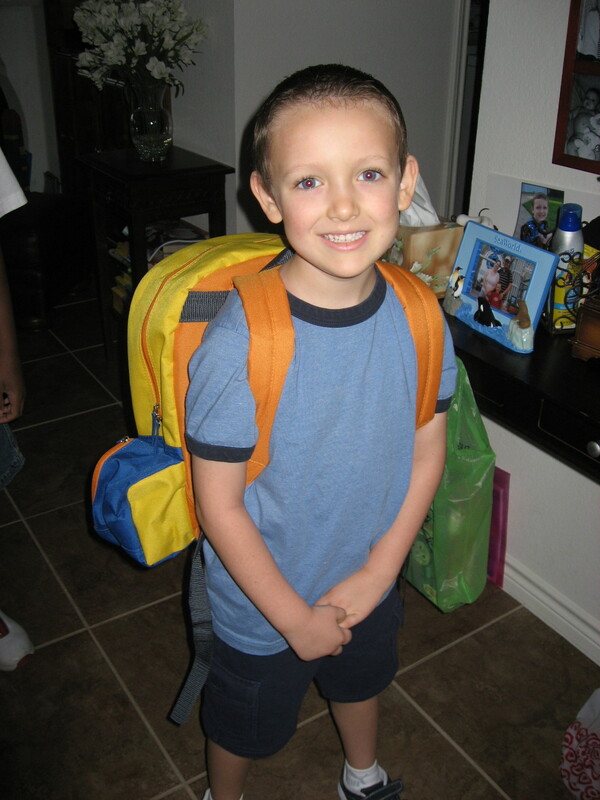 I’m looking forward to an amazing year in Kindergarten for our sweet, smart boy. Okay, so I realize now that I neglected to give an update from Ethan’s June visit with Dr. Rao. Oops! (Read my last entry about our biomedical treatments here, and the first entry here.) We made a few adjustments to his supplement regimen at that time and did another chelation (pronounced: key-lay-shun) trial. That trial was a combination of IV EDTA and Oral DMSA. Ethan was a super champ and handled the butterfly needle like a champ. Today we went in to follow up with Dr. Rao and review Ethan’s entire biomedical program. It went very well. When Dr. Rao came into the room, Ethan was watching a movie from the exam table, with his crocs on the floor. Ethan said, “Yep.” He didn’t take his eyes off of the TV. Back to today . . . We reviewed several blood and urine test results to monitor what Ethan’s supplements and diet are doing for his system. As I suspected, Ethan’s zinc levels had gone from being way too low in December to being too high. We’re going to decrease how much we supplement so we can find the perfect balance of zinc to copper, which should be 1:1. Also, Ethan has developed high glutamate, the same nasty stuff that is in monosodium glutamate (which we avoid like the plague.) So, it seems that he must be getting too much red meat, tomatoes and eggs in his diet. We’ll cut some of those and see if that level will taper back off. (The increase in glutamate could be to blame for some of Ethan’s overly emotional outbursts and meltdowns.) Regarding the outbursts, we’re also going to add GABA and Phosphatidyl Choline to Ethan’s daily supps to help level him out. I’m thinking that starting school and getting back into a very structured, regular routine will help with the outbursts, but I’m glad to have the other supplements in place before he goes back and has to adjust to being in school all day, every weekday. Finally, we got the results from the IV chelation trial from June. The Urine Toxic Metals tests revealed the best yet pull of Mercury and Aluminum with about the same amount of Lead pulled. So, today we upped his dosage of IV EDTA and Oral DMSA to see what kind of results we can get. He was so brave; he even put both arms in the air when it was all over and told the nurse, “That chelation was AWESOME!” which she said, “made her day.” Once we find the “right” dosage for Ethan (which pulls the most metals from his system with the least amount of side effects) we will start a regular schedule of chelation. So, we’ll go back to see Dr. Rao in late September to review the results from today and discuss progress again. Wish us luck with the GABA and Phosphatidyl Choline! As always, Greg chimed in with some silly teasing and said to Ethan, “After Kindergarten you’ll graduate from high school, get married and have your own kids.” Without missing a beat, Ethan replied, “Oh boy! That sounds like a busy life!” He’s right. It all passes so quickly in this busy life–if you let it. Ethan’s snappy reply offered us a brief reprieve from the whooshing of time and gifted us with several moments of laughter and the joy that comes with sharing Ethan’s pure-hearted, sweet views on life. Greg came to me at the sink and said, “That one HAS to go on your blog!” Hope you enjoy it as much as we did.